For all orders placed before midnight Thursday will be dispatched on a Monday for delivery on a Tuesday. Your 2-pint poly-bottle of Organic, Grass-Fed, Pasteurised full fat milk from the Hailsham Herd, will be chilled down to 2C, and put into a 2 pint milk container. Your milk will then be put into a sealed insulated cardboard box and delivered to you within 24 hours of dispatch. The milk will be bottled as fresh as possible and the label advises a 'best before' date. For your delivery day see the Go Shopping Tab on the main website. 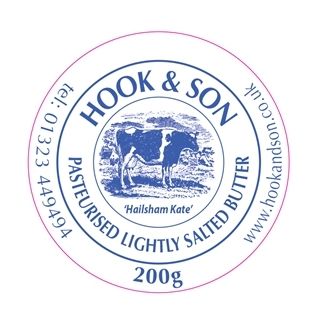 Each pack of our Organic, Grass-Fed, Pasteurised butter is handmade from our own full fat milk which we lightly season with Halen Môn, from The Anglesey Sea Salt Co.
Our wonderful Organic Grass-fed Butter is made on the farm. Each pack of our butter is handmade, churning just the cream taken from our own organic full fat milk. The unsalted butter will keep fresh if kept refrigerated for 1-2 weeks, and will freeze for up to 3 months. ONLY AVAILABLE TO ADD IN WITH YOUR MILK ORDER You can now add a pot of our wonderful grass-fed ghee in with your milk order saving yourself postage costs. 210g Jar of Ghee made from our Raw Butter here on the Farm. Ghee has a higher smoking point than any other frying oil.